Remember the Eclipse? It was a 2+2 sports coupe along the lines of the Honda Prelude, Nissan 240SX and Toyota Celica, and like those classics it’s no longer available, having been discontinued in 2012 after four generations. The list of sporty grand touring hatchback models was as numerous as there were mainstream automakers to build them back in the ‘80s and ‘90s, and Mitsubishi not only offered the Eclipse, along with multiple badge-engineered models it coproduced with Chrysler group, but the larger and more powerful 3000GT that went up against pricier sports coupes like the Mazda RX-7, Nissan 300ZX and Toyota Supra. Those were the sports car glory days, and while we’ve seen a tepid renaissance in recent years, times ain’t what they used to be. This is the crossover SUV era after all, so along with small sporty GTs that few are buying, sedans and wagons are yesterday’s news too. Enter the Eclipse Cross, Mitsubishi’s answer to a question no one was asking within the mainstream volume sport utility sector, or at least a question no one has asked for a few years. The Eclipse Cross marries a crossover SUV with a sports car, or that’s the general idea. Most of us are well aware that such sloped-back five-door concoctions have been running around in the premium class for quite some time, having started with the BMW X6 and more recently followed by the Mercedes-Benz GLE Coupe and now the all-new Audi Q8 that shares underpinnings with Lamborghini’s new Urus, plus we should give a respectful shout out to the now discontinued Acura ZDX that I happen to still love, while that latter defunct model was based on the only five-door sport CUV to attempt such contortions amongst regular mainstream brands up until now, the somewhat ungainly Honda Crosstour. On the smaller side are the BMW X4 and new M-B GLC Coupe, these models closer in size to this new Eclipse Cross, but of course in another price, luxury and performance league altogether. Premium rides aside, I must admit the new Eclipse Cross is much better looking than the ill-fated Crosstour, but instead of being backed by one of the strongest names in the industry it hails from one of Canada’s least popular brands. This means that its already very slim niche market will be skinnier still, proven by 2,140 sales from February 2018, when it went on sale, to the close of August, compared to 7,265 Outlanders sold during the same seven months. No doubt Mitsubishi didn’t expect it to rocket out of the showroom door in comparison to its most popular model, but it’s a sobering thought when factoring in that 34,055 Honda CR-Vs and 32,947 Toyota RAV4s were sold over the exact same seven months, not to mention the 28,218 Ford Escapes and 26,525 Nissan Rogues. 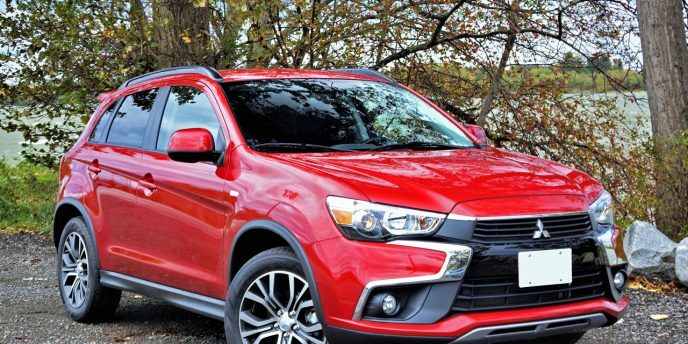 Just the same, Mitsubishi is trying to do something different and deserves our respect for a worthy effort, while the new model is quite good at what it needs to do for the most part. I’ll elaborate in my upcoming review, and like usual will only give you a few buyers’ guide-like details during this garage piece. For starters, behind Mitsubishi’s dramatic new “Dynamic Shield” frontal design that I think works much better with this Eclipse Cross than with any other application it’s been used for, resides a turbocharged 1.5-litre four-cylinder engine good for 152 horsepower and 184 lb-ft of torque. It combines with a continuously variable transmission (CVT) that’s engineered to emulate an eight-speed automatic gearbox via some of the nicest magnesium column-mounted paddle shifters in the industry. All three Eclipse Cross trims come standard with Super All-Wheel Control in Canada, Mitsubishi-speak for all-wheel drive, an advanced torque-vectoring system honed from years of Lancer Evolution rally car breeding. Yes, it’s hard to stomach the thought that this wannabe performance SUV is now the hottest model in Mitsubishi’s once proud lineup, which previously anted up the fabulous Evo X MR, an all-wheel drive super sedan that easily outmaneuvered the Subaru WRX STI and most every other compact of the era, but Mitsubishi now has its limited funds focused on practical SUVs that more people will potentially purchase, not to mention plug-in electrics that give it a good green name if not many actual buyers, at least when comparing the Outlander PHEV’s sales to the aforementioned conventionally powered compact SUVs. We can lament the loss of the Evo, but should commend Mitsubishi for the Eclipse Cross’ fuel economy that’s rated at a cool 9.6 L/100km in the city, 8.9 on the highway and 8.3 combined, which is quite good in comparison to the aforementioned RAV4 that only manages 10.5 city, 8.3 highway and 9.5 combined, but not quite as thrifty as the CR-V’s 8.7 city, 7.2 highway and 8.0 combined rating. Hidden behind a slick looking standard set of 18-inch alloy wheels on 225/55 all-season tires is a fully independent MacPherson strut front and multi-link rear suspension setup featuring stabilizer bars at both ends, which I’ll report on in my upcoming review. 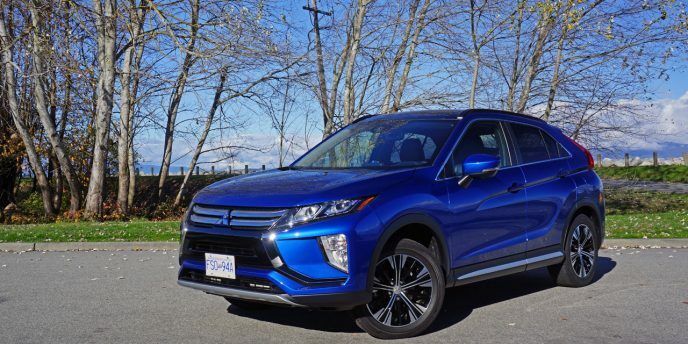 I mentioned earlier there were three trim levels, and as usual Mitsubishi supplied this Eclipse Cross tester in top-line GT guise for $35,998 plus freight and fees (go to CarCostCanada for all pricing details, including dealer invoice pricing and rebate info that could save you thousands), which meant came loaded up with LED headlamps, a head-up display, a multi-view backup camera with dynamic guidelines, 710-watt Rockford Fosgate Punch audio with nine speakers including 10-inch subwoofer, a heatable steering wheel, heated rear outboard seats, leather upholstery, a six-way powered driver’s seat, a dual-pane panoramic glass sunroof, and more, not to mention everything from the second-rung SE model’s optional Tech Package that includes automatic high beams, adaptive cruise control, forward collision mitigation with pedestrian warning, lane departure warning, auto-dimming rearview mirror with an integrated Homelink garage door opener, roof rails, and a nice silver painted lower door garnish. Standard SE items pulled up to GT trim include the previously noted paddle shifters, proximity-sensing keyless access and ignition, an electromechanical parking brake (the base model gets a regular handbrake), a leather-wrapped steering wheel and shift knob, auto on/off headlamps, rain-sensing wipers, dual-zone automatic climate control, blindspot warning, and more for $29,998, while features from the $27,998 base ES model that are still used by the top-tier GT include LED DRLs, fog lamps, LED turn signals integrated within the side mirror caps, LED taillights, tilt and telescopic steering, a colour multi-information display within the gauge cluster, an “ECO” mode, micron filtered automatic climate control, heated front seats, a lower console-mounted touchpad controller for the standard 7.0-inch touchscreen infotainment display, Apple CarPlay and Android Auto, a rearview camera, two USB charging/connectivity ports, Bluetooth phone connectivity with audio streaming, satellite radio, and more. Last but hardly least in this practical class is passenger and cargo space, with the former needed to be expanded on experientially in my review and the latter measuring 640 litres (22.6 cu ft) behind the standard 60/40 split-folding rear seatbacks and 1,385 litres (48.9 cu ft) behind the front row, making it more accommodating for cargo than the subcompact RVR and less so than the compact Outlander. Honestly, I'm not a big fan of the latest trend toward special blacked out versions of new cars and SUVs, at least not normally. 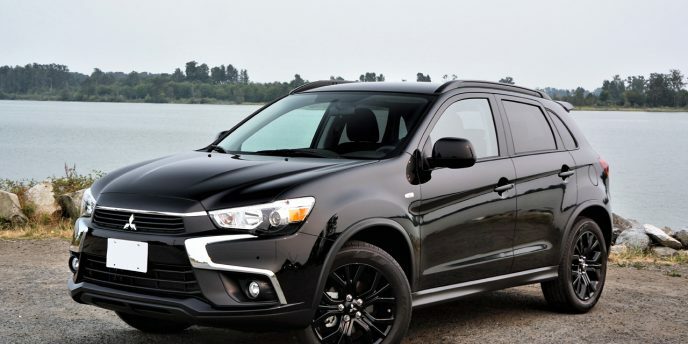 Fortunately, Mitsubishi didn't go so far as to darken the new RVR SE AWC Black Edition's signature chrome detailing up front, and left its tailpipe finisher and various emblems in bright metal as well. Instead, this Black Edition gets an all-black exterior paint treatment, the usual matte black lower body cladding, a sweet looking set of glossy black painted 18-inch multi-spoke alloys, and similarly shiny black roof rails. That, and all its protruding trim bits (a.k.a. mirror caps, door handles, rooftop antenna, and rear spoiler) painted body colour as well, and it's a wrap, figuratively and literally. Remember when Mitsubishi had a full lineup of exciting sports models? When first arriving on the Canadian market in late 2002 for the 2003 model year I attended their all-model launch in Montebello, Quebec and was impressed by much of what they had on offer. In fact, I reviewed every single car and SUV available that year, which included compact, mid-size and full-size sedans, compact, mid-size and full-size SUVs, plus a sports coupe and convertible. 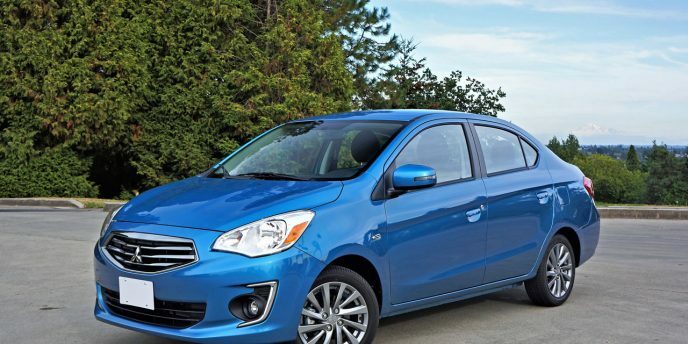 Cars don’t come more basic than the Mirage in Canada, but here at TheCarMagazine.com we celebrate simple. After all, where else can you buy a new car for just $12,698? Over at Nissan where the equally small and even simpler Micra hatchback sells for just $9,988 and is a whole lot more fun to drive. 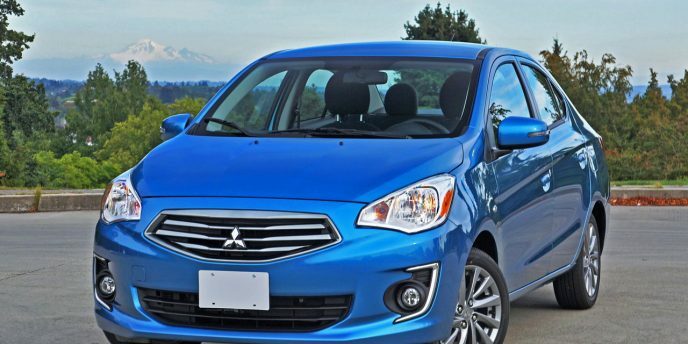 The Mirage focuses more on comfort, especially in new four-door G4 guise, which is how Mitsubishi dressed up our 2017 loaner. We’ll leave our thoughts about styling for the upcoming review, but suffice to say it excites our eyes as much as it’s 78 horsepower 1.2-litre three-cylinder ignites our Evo X aspirations, but then again its as-tested 6.9 L/100km city and 5.7 highway fuel economy put a smile on our faces. That’s with the optional continuously variable transmission (CVT), the base model quite not quite as thrifty with its five-speed manual gearbox. The CVT comes standard in $18,298 SEL trim, lesser models including the $14,498 ES 5MT and the $15,698 ES CVT. As tested the G4 SEL is actually very well equipped with 15-inch alloys, auto-off halogen headlamps, fog lamps, heated power-adjustable body-colour side mirrors with integrated turn signals, variable intermittent wipers, cruise control, a multi-information display, a leather-wrapped multifunction steering wheel with tilt, piano black and chromed interior accents, micron-filtered auto climate control, Bluetooth phone connectivity with audio streaming, voice activation, a USB port, remote powered locks, powered windows, four-speaker display audio with Apple CarPlay and Android Auto (Porsche doesn’t even offer the latter), a rearview camera, premium fabric upholstery, heatable front seats, a rear centre armrest with integrated cupholders, hill start assist, all the expected active and passive safety equipment including a driver’s knee airbag, and more.